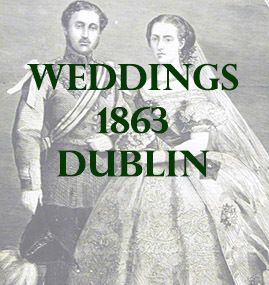 The following list contains marriages that mention places in county Dublin. At the Presbyterian Meeting House, Capel-street, Dublin, Marcus Eustace, L.K.Q.C.P. and L.R.C.S.I. of Highfield Drumcondra, to Elizabeth Jane, daughter of the late Andrew Wallace, of Dublin. At Rathmines, Dublin, Richard Dolan, Esq. (Alliance Gas Company), to Maria Elizabeth, daughter of the Lte John Daly, Esq., Comptroller of Her Majesty’s Customs. At the Roman Catholic Cathedral, Longford, Patrick O’Farrell Esq., of Dublin, to Kate Winefred, daughter of Patrick Heron, Esq., merchant, Fenagh county Leitrim. At St Peter’s Church, Dublin, Mr Horatio Yeates, of Leinster Street, Dublin, to Kate daughter of the late Samuel Barrett, Esq. At Athenry, Richard Hastings Firth of Leinster Road, Dublin Esq., C.E. to Lavinia daughter of the late Pater Lambert of Castle Ellen, county Galway Esq. At St Thomas’s Church, Dublin, Samuel Worden, sq., son of the Rev. John Worden, Glastonbury Somersetshire, to Kate, daughter of D.T. Sullivan, Esq., Upper Gloucester Street. At Loughgilly, William J Wellad Esq., Upper Rutland Street, Dublin to Mary Elizabeth, daughter of the Rev. Charles King Irwin, Rectory of Loughgilly, county Armagh. In Dublin, James Andrews, son of John Andrews, Esq., J.P., of Courlin, in the county of Down, to Mary Catherine, daughter of Robert Andrews, Esq., LL.D., Q.C., Mountjoy-square, Dublin. At St Thomas’s Church, Dublin, Thomas R Brunskill, Esq., to Anna Jane, daughter of Kivas Tully, Esq., Commander R.N. At Malahide Church, Dublin, B. Louis Simner, Esq., H.M.’s Military Train, son of A Simner, Esq., Whitehall, London, and Denbigh, North Wales, to Frances Mary, daughter of Wm. Edward Bolton, Esq., Malahide. In Dublin, Matthew J Butler, Esq., of Dublin, formerly Clonmel, to Mary Anne, daughter of Thomas Purcell, Esq., of Mary Mount, Queen’s County. At Clontarf Church, Valentine, son of the late Dr. Valentine Flood A.M., M.r.i.a,…….F.R.C.S.I. to Lizzie Stockdale Taylor daughter of the late Humphrey Bolster Esq. In Grangegorman Church, John Carbury Shorten, of Palmerston Place, Dublin, to Marian Louisa, daughter of the late Daniel Ruttle, solicitor, formerly of Rathkeale. At St. Peter’s Church, Dublin, Robert Dockeray, M.D., of Kilteagan, to Agnes Henderson, daughter of the late Mr. Wm. Burnside, of Straford-on-Slaney. In St. Anne’s Church, Dublin, William Henry Annesley, Esq., Commander H.M.S. Liverpool, son of the late Captain the Hon Francis Charles Annesley, R.N., to Lucy Anne, daughter of Denis H. Kelly Esq., D.L. Castle Kelly, county Galway. On the 14th inst., by special license, by the Rev. Robert Flemyng, M.A., at her brother’s, Captain Ormsby Rose, Merrion-square, North, Richard Butler Willington, Esq., Captain 77th Regt., to Mary, second daughter of the late Simon L Rose. Esq., of Ballycullen, county Limerick. At St. Peter’s Church, Dublin Richard Carleton, Esq., of Woodville, Sandford, to Cordelia, daughter of William Robert Stephens, Esq., Fairfield. Rathgar. At St. Mary’s, Donnybrook, John Clare, Esq., of Park-avenue, Sandymount, to Catherine Johanna Rigby, daughter of the late John Jason Rigby, Esq., of Dublin. At Banbridge Church, Edward Hudson Kinahan, son of the late Alderman Kinahan, of Merrion-square, Dublin, to Emily Isabella, daughter of the Rev. Daniel Dickenson, Rector of Seapatrick, county Down. In St. Stephen’s Church, Dublin, John L Dixon, Esq., of Toronto, Canada West, to Jane daughter of the late Samuel Williams Esq., of Longford. A Rathfarnham Church, John Robert Buchanan, Captain 6th Royal Lancashire Regiment, to Henrietta, daughter of Richard Beverly Usher, late Captain 86th Regt. In the Centenary Chapel, Stephen’s Green, Dublin, Charles M. Elliott, Esq., to Lydia, daughter of Jonathan Bennett, Esq., Euston-terrace, Ranelagh-road. At St. Anne’s Church, Dublin, Christopher Joynt, Esq., M.D. of the Indian Army, and late of Scinde Horse, to Lilly Anna, daughter of W. Noble Holton, Esq., J.p. Woodberry House, Athlone, county Roscommon. At St. George’s Church, Dublin, James Leslie, of Armagh Esq., M.D. to Georgina daughter of the late George Kaye, of Vera Lodge, Armagh Esq., formerly Captain 62nd Regt. At St. Kevin’s Roman Catholic church, Dublin, George Butler, Esq., son of the late Thomas Butler, Esq., of Dublin, to Marion, daughter of Mathew Longfield Godkin, Esq., of Dungarvan, county Waterford. At St. Peter’s Church, Dublin, James John Campbell, Esq. of Kingstown to Lucy Elizabeth daughter of the late Capt John Robert Sanders, Royal Artillery. At St. Peter’s Church, Dublin, Henry Smyth of Holywell in the county od Roscommon Esq. to Alicia daughter of Edward Blakeney, later of Sallymount in the same county Esq. In the Presbyterian Church, Kingstown, Henry Keisall, Captain 16th Regt., to Susan Hope, daughter of the Rev. Hope M. Waddell. At Clontarf Church, county Dublin, the Rev William Conyngham Plunket, son of the Hon John Plunkett, to Annie Lee, daughter of Benjamin Lee Guinness, Esq. At St. Anne’s Church, Dublin, Osmond De Lancy Priaulx, Captain 94th Regiment to Isabella Jane, widow of Ralph P. Gore Esq. In St. Peter’s Church, Dublin, Henry Lundy, son of J Lundy, Esq., Billis, county Cavan, to Elizabeth, daughter of R. Buchanan, Esq. Carrig House, county Cavan. At Donnybrook Church, Dublin, John H.C..B. Hornibrook Esq., C.E. son of the late John L. Hornibrook, Esq., of Bandon, to Jane Cecil Meta, daughter of Edmond Henry Pery Baylee, Esq., and granddaughter of the late Sexten Baylee Esq., of Strand House, Limerick. At St. Peter’s Church, Dublin, the Rev William George Boyce, son of John Boyce, Esq., of Carnew Castle county Wicklow, to Susanna daughter of Captain George Hoey, Pembroke Place, Dublin, and Hoey park, county Wicklow. At St. Peter’s Church, Dublin, William Henry, son of Henry Bible, Esq, of Cork to Annie, Relict of the late Charles Kohler Esq., of Dublin, and daughter of the later Major John Cornwall Odell, 41st Regt. Madras Native Infantry, formerly of the country Limerick. On the 3rd inst., at Donnybrook Church, county Dublin, Alexander George, eldest son of the late Alexander J Armstrong, Esq., C.E. County Surveyor of Cavan, to Jane Amelia, daughter of the late George Bell Booth, Esq., of Drumcarbin, county Cavan. At St. Anne’s Church, Dublin, Richard Alfred, son of the late John Hamilton, Esq., Mill View county Donegal, to Henrietta Wybrants, Daughter of the late Charles P. Dawson, Esq., of Castle Dawson, Londonderry. At Kingstown, Captain Stephen Egan, 20th Regiment, to Matilda Anna, daughter of Daniel Corbett, Esq., of Dublin, and Crofton-terrace, Kingstown. In St. Peter’s Church, Dunlin, J.L. Darby, son of the late Joseph L Darby Esq., of Bray, to Maria, daughter of Martin Cregan Esq., R.H.A. At St. Andrew’s Church Westland Row Dublin, Captain Wm McDermott, son of Wm McDermott Esq., of Springfield, county Galway, to Mary Helena, daughter of the later Captain Martin Lynch, of Lowbuy, county Roscommon. At Kilkeel, county Down the Rev Stanley Treanor, Curate of Tuam, to Charlotte Elizabeth, daughter of Robert Evatt, Esq., J.P. and D.L., of Mount Louise, county Monaghan, and Kenilworth Terrace, Rathmines. At Monkstown Church, County Dublin, Edmund W. Molony Esq., of the Civil Service, Bengal, third son of James Molony Esq., D.L. of Kiltanon House, County Clare, to Frances Selina second daughter of Arthur Edward Gayer, Esq., Q.C., LLD of Salerno, Killiney, one of the Ecclesiastical Commissioners for Ireland. In Rathmines Church, county Dublin, Thomas Coote, son of the late John Bunbury Leonard Esq., of Clermont House, county Wicklow to Frances, daughter of the late Alfred Taylor Esq. Nicholas Leech Esq., Drogheda to Mary Theresa, daughter of Patrick Reynolds Esq., Dublin. In St. Stephen’s Church, Dublin Henry Grey MacGregor Esq., 17th Regt. Son of Lieutenant- General Sir Duncan MacGregor K.C.B to Rosetta, daughter of the right honourable Joseph Napier, ex-Lord Chancellor of Ireland. At St. Andrew’s Westland row Dublin Captain John Jas. Mathew, son of the late Francis Mathew, Esq of Rockview, County Tipperary, to Delia, daughter of John Foster Esq., of Rino County Clare and Normangrove, county Galway. At St. Michael’s Roman Catholic Church, Kingstown, Andrew Martyn Esq., son of the late Edward Martyn Esq., of Tullyra County Galway to Mary Josephine, daughter of Oliver Dolphin, Esq. of Turoe, in the same county. At Rathfarnham Church county Dublin Samuel Buchanan, Esq. C.E. to Arabella Madelene, daughter of Richard Beverly Ussher, late Captin 86th Regt. At Seapatrick Church, Banbridge, George Kinahan, son of the late George Kinahan, Esq., of Roebuck Park county Dublin to Margaret Hayes, daughter of the Rev. Dr. Dickinson, Rector of Seapatrick county Down. In Donnybrook Church James Kennedy Esq., J.P. of Rosetta, county Down to Nannie, daughter of the late James Steward, Esq., of Cherryvale and Greencastle, Belfast. At Bray, county Wicklow, Richard Cooper Todd, Esq., Surgeon 60th Rifles, to Emily Kate, daughter of the late Thomas Wilson, Esq., of Stillorgan, county Dublin. At St. Andrew’s Church, Westland-row, Dublin, John J. Cox, Esq., son of Alderman Cox, of Waterford, to Mary Madeline, daughter of Peter Paul MacSwiney, Esq., Lord Mayor elect. In Trinity Church, Rathmines, John Joseph Mills, Esq., Lieut. 5th Royal Lancashire Militia, to Elizabeth Frances, daughter of John McNally, Esq., solicitor, of Dublin. At the Metropolitan Cathedral, Marlborough Street, Dublin, John Forrestal Cunningham of Oakley Park, in the county of Galway, Esq., to Lizzie Mary, daughter of James Kearns, of Summer Hill, Dublin, Esq. At St. George’s Church, Dublin, John Williamson, Esq., son of the late M. Williamson, Esq., solicitor, Bailieborough, to Mary, daughter of the late John Brown, Esq., County Inspector of the Contabulary. At Donnybrook Church, William John, son of Mr John Rowland, of Bache House, Chester to Anna Kate, daughter of Mr Henry Digges, of Lower Gardiner Street, Dublin. At the Church of St Andrew, Westland Row, Dublin, Mr. William O’Brien, Upper Ormond Quay, to Eliza, daughter of Mr. Patrick Thomas of Dublin. At Trinity Church, Rathmines, Richard Hand Wood, Esq., M.D., J.P., and Coroner, Sligo, to Elizabeth Pitts, widow of Robert Pitts, Esq., Dusseldorf, and daughter of the late Rev. Fossey Taekaberry, of Sligo. At Drumcondra Church, Alexander Tyndall, Esq., Strandville, Clontarf, county Dublin, son of the late Samuel Wilkinson Tyndall, Esq., J.P., to Eliza Anne, daughter of James L. Nixon, Esq., of Mount-Auburn, Richmond. On the 25th instant at Rathmines R.C. Church Dublin by the Rev M Collier, Michael Egan Esq., of Patrick street in this city (Limerick) to Anna Frances, only daughter of Michael Ryan, Esq., Clare Cottage Athlunkard. At the Metropolitan Church, Dublin, James Lyons Esq., of Dublin to Mary daughter of William Pentland Esq., of Castle Avenure Clontarf. In Bootstown Church, county Dublin, John Pemberton, Es., of Glenville, Blackrock, to Annie Isabella daughter of the late Captain Bateman, J.P. of Leslie Park, Croydon, Surrey. In St. Thomas’s Church, Dublin, Cuthbert F. Daly, Esq., Captain R.M.L.L, to Elizabeth, daughter of the late W. Hopkins, Esq., Frayne, county Meath. At St. Peter’s Church, Dublin, Thomas James Rawson, Esq., M.D. Barrowville, county Carlow, to Janet Sempill, widow of John Newton, Esq., Bagenalstown House. At the R.C. Church of St. John the Baptist, Blackrock, county Dublin, James Vaughan Esq., Royal Hospital, Haslar, to Mary daughter of the late Nicholas R. Caffrey Esq. In the New Church, Bray, Robert M. Tilly Esq., to Katherine Crofton, daughter of James Crofton Dodwell Esq., J.P. Shankhill House, county Dublin. At Monkstown Church, county Dublin, Samuel William Nugent, C.E., Bengal Presidency, India, to Charlotte Elizabeth daughter of the late A. Oulton Esq. At St Patrick’s Church, Rathgar, James Dawson Esq., to Emily Josephine, daughter of the late John William Spain Esq., Leister Square Rathmines. Nov 13th at St. Andrew’s Church, Westland Row, Dublin, Thomas MacMahon Esq., Knockane, county Clare, to Marcella, daughter of the late James Lynch, Esq., Windfield, county Galway. At St Nicholas’s R.C. Church, Galway, Henry Joseph Arthur, son of the late Arthur Brew Esq., Grace Park county Dublin, and formerly of Cahirmacrea, county Clare to Fanny Alicia, daughter of Benjamin Jackson, Esq., County Inspector of Constabulary Galway West. On the 18th inst., at Gardiner Street R.C. Church, Dublin Simon E. Sellor Esq., of Tristane, county Galway, third son of Michael Sellor Esq., of Limerick to Kate Agnes, third daughter of the late Timothy Larkin, Esq., of Craugh, county Galway. At St Peter’s Church Dubllin, Thomas Rutherford jun. of Macken Lodge, county Leitrim, Esq., to Lilla, daughter of the late Rev. Daniel Flynn of Harcourt Street Dublin. At St. Peter’s Church, Dublin, P. Tomalin, Esq., Carlow, to Fanny, daughter of the late Peter B. Mosse, Esq., Rutland House, Carlow. At St. Stephen’s Church Dublin, D.W.R. Buchanan Esq., to Lady Katherine Hely Hutchinson eldest daughter of the Earl of Donoughmore. At St. Thomas’s Church Dublin, William Erskine Esq., of Harristown House, Ardee, County Louth, to Marianne, eldest daughter of James Hurst Esq., North Cumberland Street, Dublin. In St, James’s Church, Dublin, James Poyner, Esq., of Dublin, to Margaret, daughter of the late Thomas James Leonard, Esq., of Carnew county Wicklow. At St. Thomas’s Church, Dublin, Walter Mitchell, Esq., of Portadown to Annie Jane, daughter of the late R. Brownlow, Esq., Rich-hill, county Armagh.